Classic and Stylish all in one. Our New Red Wool Coat features classic style lines that are not “over the top”. 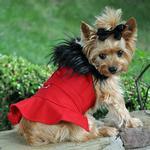 It also has a thick black faux fur collar and understated matching red buttons for accent. This one is destined to become our #1 selling coat and is a must have for your little girls wardrobe. Our wool coats all include a matching leash and the product has a built in D-ring for easy walking.